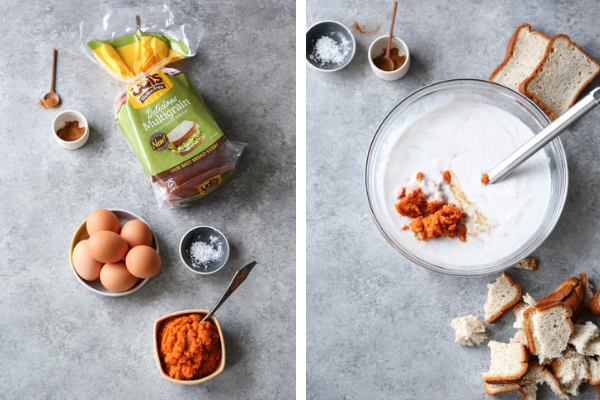 This overnight french toast recipe is brought to you in partnership with my friends at Udi’s Gluten Free. As always opinions are 100 percent my own. Thank you for supporting the brands that make this site and all my pumpkin casserole cravings possible! I’ve talked before about the distinct, wholly cringe-worthy sensation of looking back over your old work. I’ve thought lovingly of this remark whenever I flip through my first book, In the Small Kitchen. 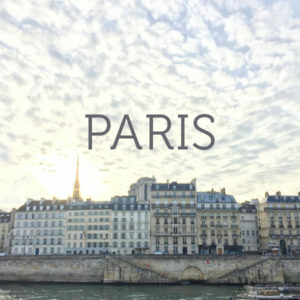 It’s not that I’m not proud of the end product—I am! Rather, it feels like a relic from a different phase of life, when I was 23 and making a trough of homemade mac and cheese felt healthy. Almost a decade later, my life looks a lot different. My kitchen is no longer small (hallelujah). There’s a ring on my finger, which makes reading some of the tales in the Dating and Food chapter extra cringy. And most notably, my health and diet mean that I can no longer eat 75 percent of the recipes I used to in my early twenties. 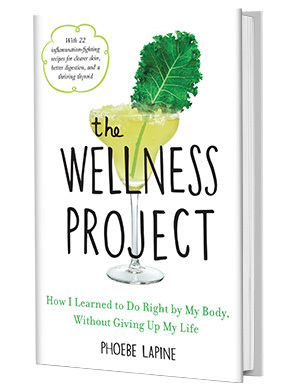 If you’ve followed my story or read The Wellness Project book, then you know the biggest irony of my Hashi recovery is that I was told to go gluten-free two weeks before this cookbook came out. So even as I was promoting the recipes, I couldn’t so much as lick the spatula when I made them. Still, over the last 7 years, I’ve found myself cracking open the spine, reminiscing about some of my favorite dishes in there, and figuring out how to make versions of them that better fit my current healthy hedonism standards. There was this riff on onion dip, a lentil version of the vegetarian chili, and this updated take on my mom’s detox soup (which was maybe the healthiest recipe in there in the first place). 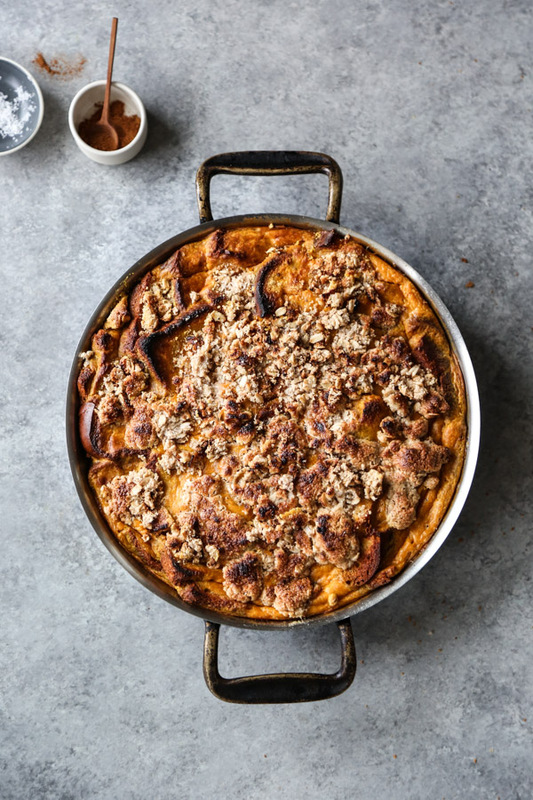 This week, I took on the slightly more daunting challenge of creating a gluten-free, dairy-free take on the baked French toast recipe in the book, also known as the best French toast casserole I’ve ever eaten. Since bread is the main ingredient, and since I used to start with something exceptionally decadent like challah or brioche, this was a tall order. But I’ve long fallen back on my friends at Udi’s Gluten Free to make all my toast visions of grandeur a reality. Their Gluten-Free Delicious Multigrain loaf is what sandwich dreams are made of. It’s soft, slightly nutty without the grit, and packed with more fiber than the average white. 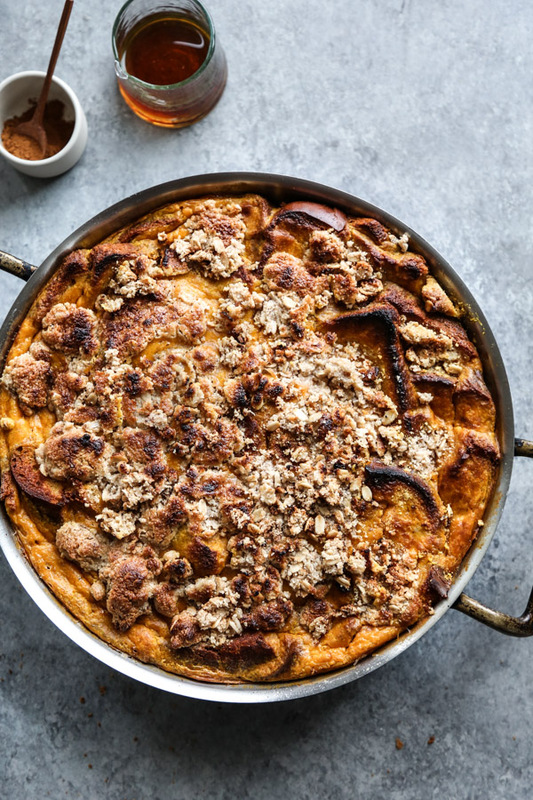 I thought it would be the perfect substitute for this pumpkin French toast bake. The beauty of the overnight French toast technique is that it’s completely fuss-free for serving a crowd. But you can also easily bake off the whole casserole after an hour of soaking the bread in the custard and still get a delicious result. The leftovers reheat well throughout the week, and even though the richness of the pumpkin custard makes it feel like more bread pudding than French toast, I promise that with only 1/4 cup of maple syrup in the whole thing and lots of eggs for protein, you could do worse. 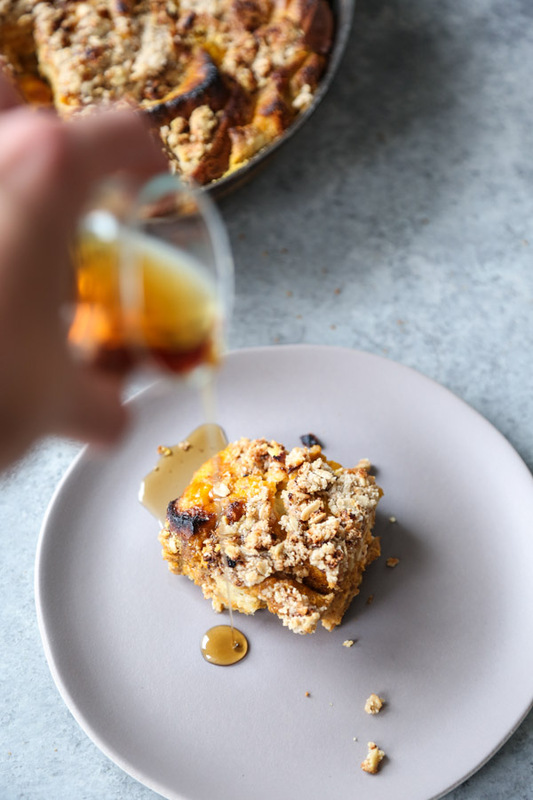 The streusel topping might feel a little extra, but I promise it couldn’t be easier. 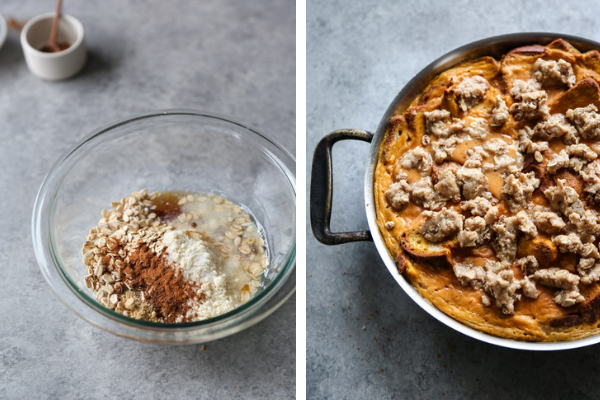 The oats and almond meal add even more protein and fiber to the mix, and the spices add that pumpkin pie scent, but you could also omit the crumble and still have a fabulous breakfast. 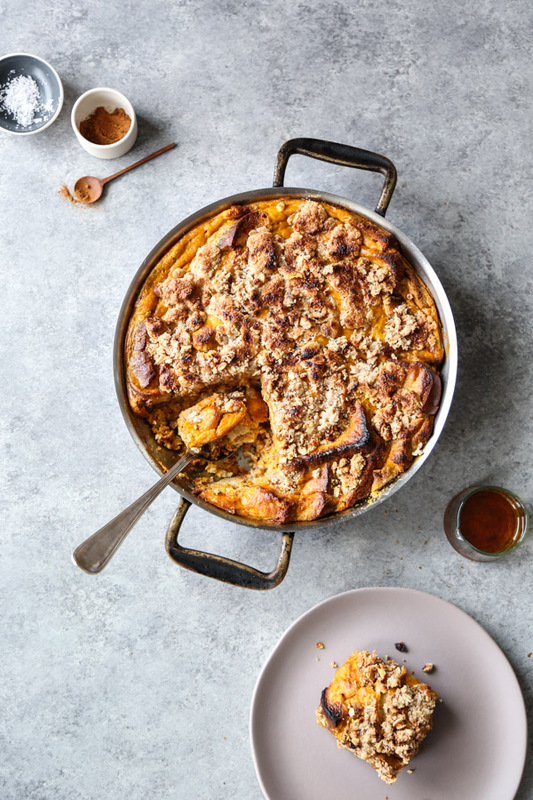 Read on for the recipe for this insane fall overnight French toast casserole meets pumpkin pie. If you’ve tasted the old version from my book, I think you’ll agree that this one holds up! 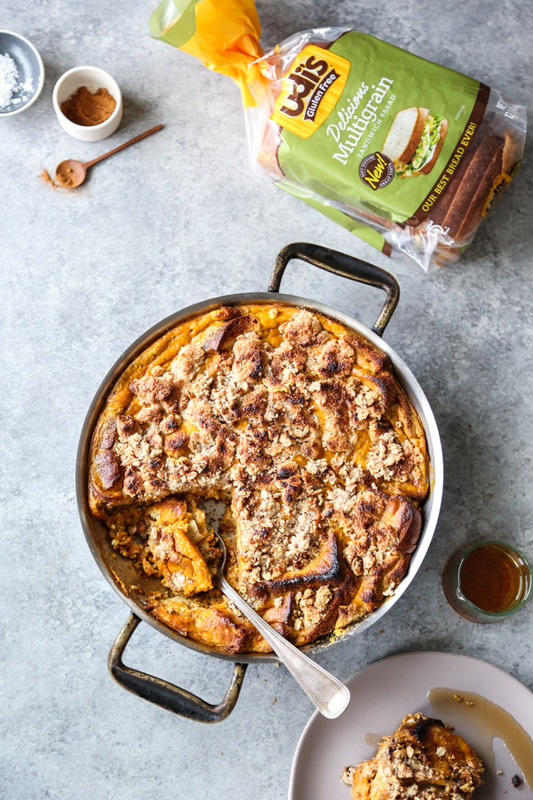 This make ahead pumpkin French toast casserole is completely easy and stress-free thanks to the overnight technique. 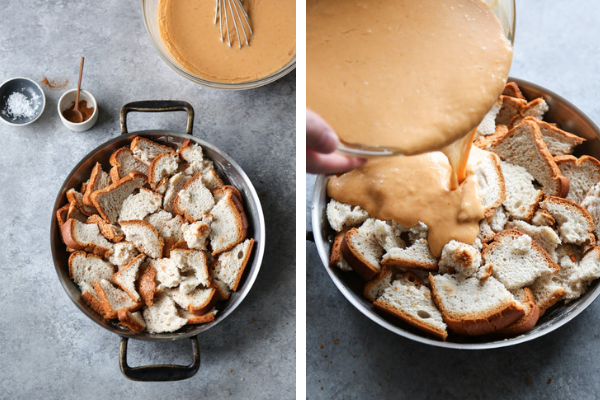 Simply soak the bread in the pumpkin custard and then bake it when you’re ready. Feel free to omit the topping if you want to simplify further, but I think it adds a nice bit of crunch and fiber to the recipe. Make the custard: in a large bowl, whisk together the almond milk, coconut milk, eggs, pumpkin puree, maple syrup, coconut oil or ghee, vanilla, and sea salt until smooth. Grease a 9x13 casserole dish with coconut oil or ghee. Roughly tear apart the Udi’s Gluten Free Delicious Multigrain Sandwich Bread into 2-inch pieces and arrange in the pan in an even-ish layer. 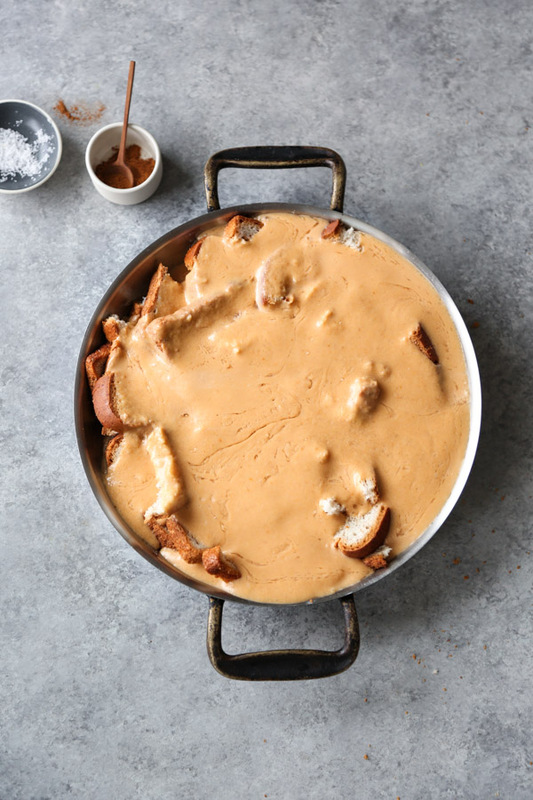 Pour the custard over the bread, using your hands or a spatula to press down any rogue pieces so they are all more or less submerged. Allow the bread to rest at room temperature for at least an hour so it absorbs the custard, or cover and place in the fridge to sit overnight. When ready to bake the pumpkin French toast, preheat the oven to 400 degrees F.
Transfer the casserole dish to the middle of the oven and bake for 20 minutes. Meanwhile, in a medium mixing bowl, combine the ingredients for the topping: with a spoon mix together the coconut oil, almond flour, oats, maple syrup, cinnamon, garam masala, and ginger. Place the bowl in the refrigerator until the bread is ready. 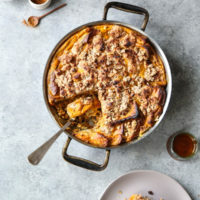 Remove the French toast casserole from the oven and using your fingers to separate the mixture into crumbles, top with chunks of the topping. Return to the oven for 20 to 30 minutes, or until the French toast is puffed like a soufflé and nicely browned on top. 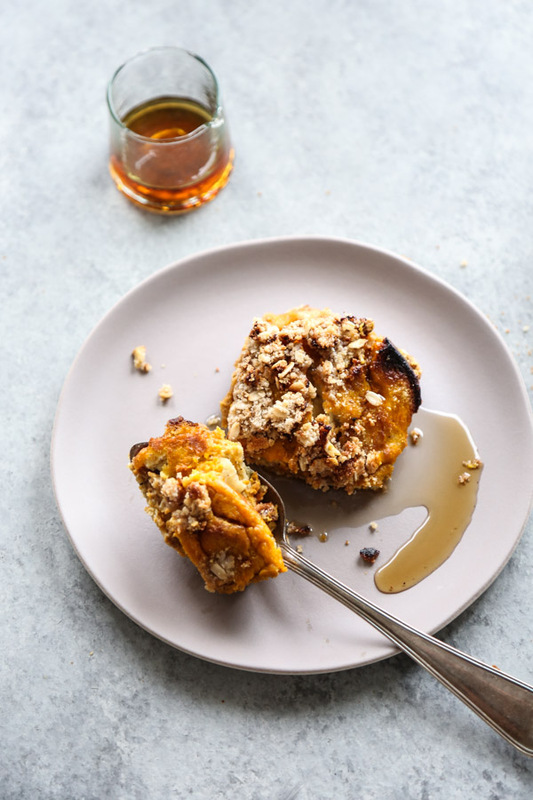 Allow the pumpkin French toast to rest in the pan for at least 10 minutes before cutting into it. Then serve topped with additional maple syrup, if needed. This post is brought to you in partnership with my friends at Udi’s Gluten Free. As always opinions are 100 percent my own. Thank you for supporting the brands that make this site and all my pumpkin French toast cravings possible! I NEED TO TRY THIS ASAP!!!! I love anything pumpkin and even more this time of the year, and combining them with french toast omg. Take my money and time now lol. i will take it all!! 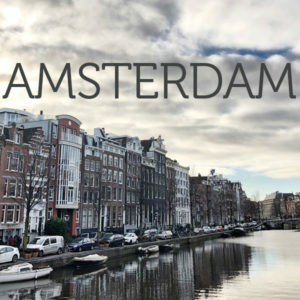 haha – but really it is quite cheap and quick! This was so, so good! I live far away from the USA currently, but was gifted some UDi’s that a colleague accidentally ordered in bulk. I made this and your almond ginger herb crusted salmon for brunch today and both were a big hit. I knew how good the salmon is, but this is prefect. Love the texture and that it is not too sweet. And the streusel was the prefect addition to the custardy base!